Videos: A stream of tweets using the hashtag that have videos in them. More: A dropdown menu that has a few great options to pick from, including “From people you follow” and “Near you.” You can also save your search here by clicking “Save this search.” To access it later, simply click into the search box on the top right of your Twitter home screen and it’ll appear as a saved search. On the left-hand side of the screen on the #MotivationMonday stream, you’ll find “Related searches.” This is especially useful if you’re looking for unofficial hashtags for your own events and campaigns and others’. As long as your account is public, anyone who does a search for that hashtag may find your tweet. There are a few ways to find hashtags on Twitter. If you already know the hashtag you want to search for, there are four main ways to search for it: a simple search, an advanced search, monitoring using a third-party tool, or typing it directly into the URL. 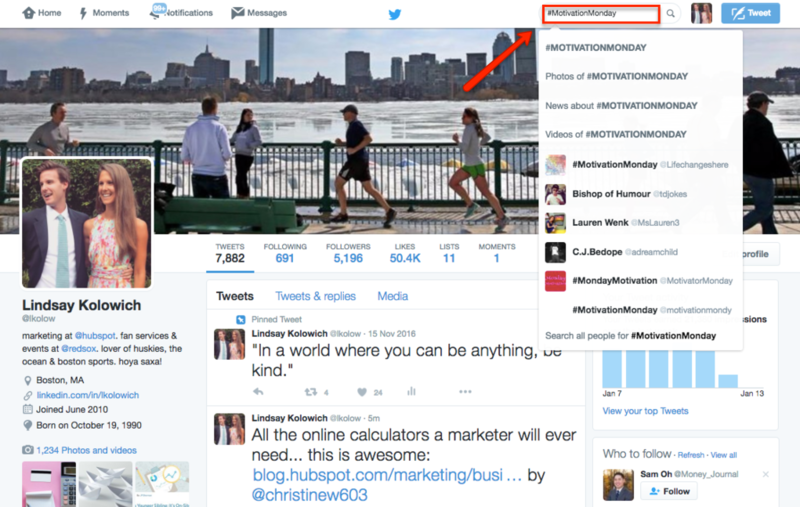 If you’re searching for a hashtag but want to include more details in your search, try Twitter’s Advanced Search. Here, you can search for tweets with specific words and phrases, written in a certain language, from certain accounts, near certain locations, published on certain dates, and even containing smiley 🙂 or frowny 🙁 faces. The results show up in a stream with different toggle options, just like our original hashtag search. You can also use a third-party monitoring tool like HubSpot’s Social Inbox to monitor certain hashtags. These tools will put certain hashtags in a stream beside any other streams you’ve set up in the tool already. Finally, you can search for a hashtag by typing it directly into a URL like so: twitter.com/InsertHashtagHere. 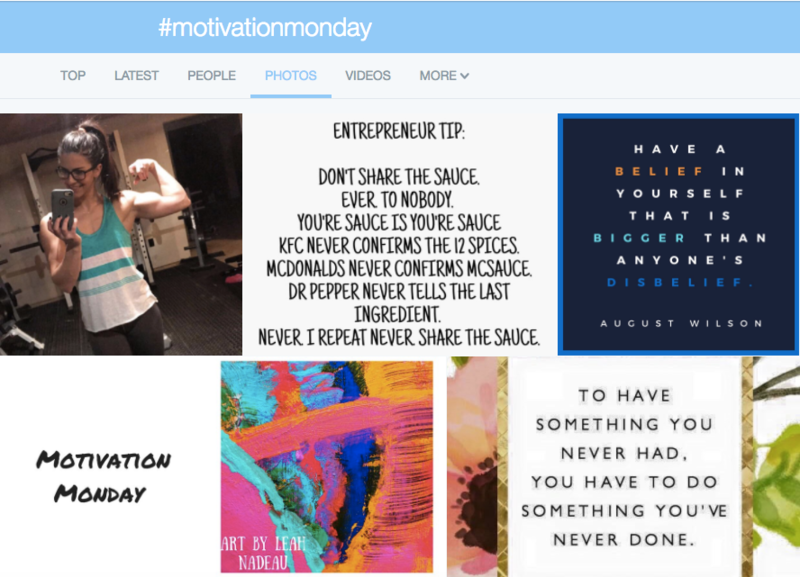 So #MotivationMonday can be found at twitter.com/#MotivationMonday. If you’re searching for popular hashtags from scratch, the best place to look is the trending topics bar on the left-hand side of your homescreen. 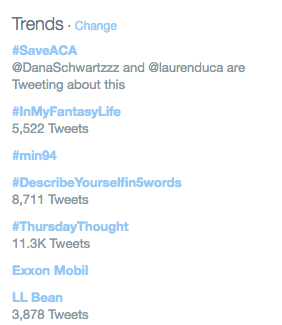 Popular hashtagged words often become trending topics — which are topics so many people are talking about that they are a “trend.” The topics bar will also show you if accounts you follow are tweeting about the trending topics. By default, Twitter tailors these trending topics to you based on your location and whom you follow. If you want to change the location Twitter uses to tailor your trends, you can do so by clicking “Change” to the right of “Trends.” In the window that appears, click “Change” again, and then enter in the location information you’d like Twitter to use instead. Twitter’s native “trending topics” is limited to only a few hashtags, so if you want to find more outside of trending topics and you don’t know what to search for, consider using Advanced Search to browse tweets, or a third-party application like Trendsmap. 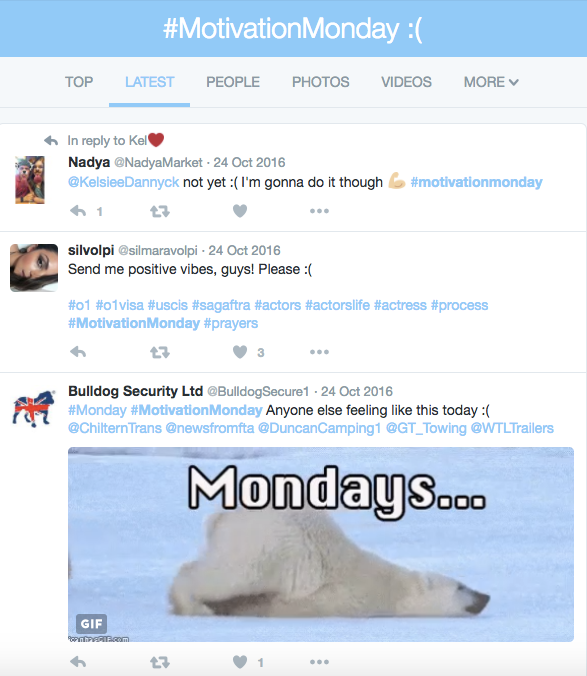 Along with hashtags for events, campaigns, and promotions, there are these unique things on Twitter called Twitter Chats. 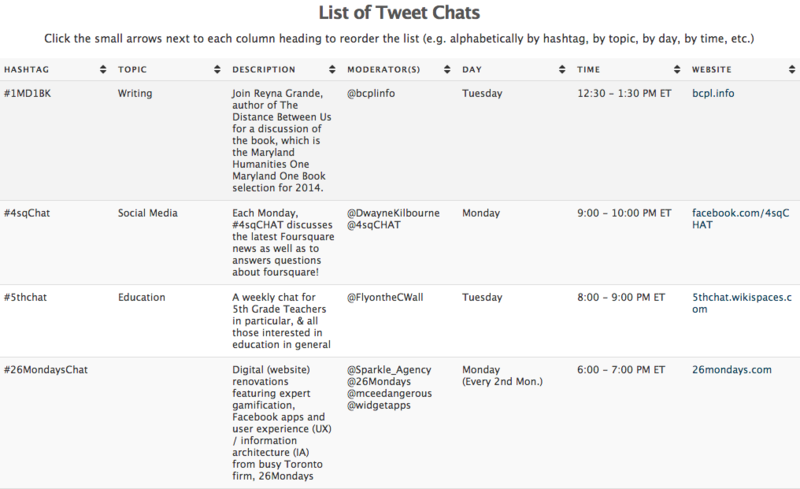 Twitter Chats are live Q&A sessions organized around a hashtag — either on the fly, or at a pre-arranged time. There are Twitter Chats about pretty much everything, from marketing to personal finance to affinities for cats. If you’re looking for Twitter chats to engage in, check out TweetReports’ Twitter Chat Schedule, which you can toggle by date, hashtag, and topics like writing, social media, and so on. 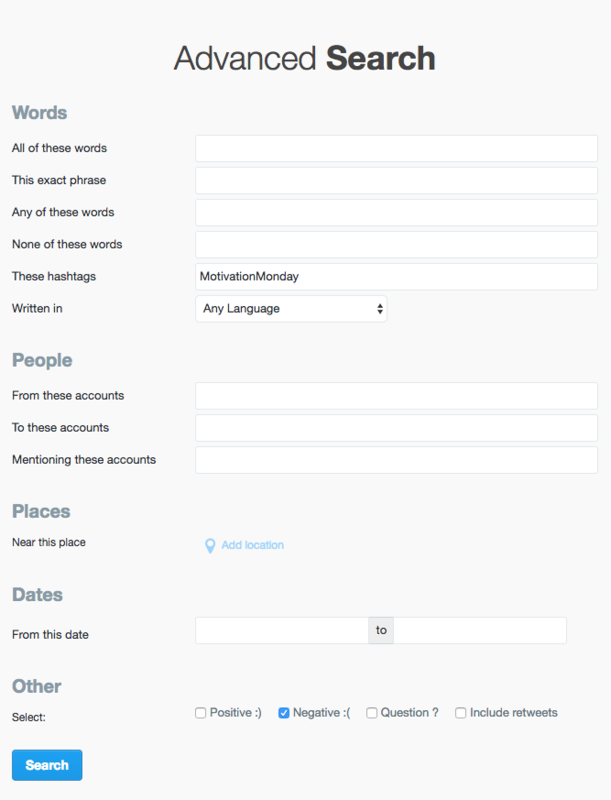 You can also submit your own Twitter chats to be considered. Like on Twitter, a Facebook hashtag ties the conversations of different users into one stream. But unlike Twitter and Instagram, where many people have public accounts and their posts can be seen by anyone, most people’s Facebook posts and accounts are private. This means that even if individuals are using hashtags, they aren’t searchable. The result? The hashtags you can search for on Facebook tend to be published by influencers, brands, and publishers, rather than by individuals. Most of the good stuff takes place in the center of this page. For the hashtag #MotivationMonday, you’ll see there are a whole bunch of ways to toggle the hashtag stream — even more than we have on Twitter: Top (the default), Latest, People, Photos, Videos, Shop, Pages, Places, Groups, Apps, and Events. 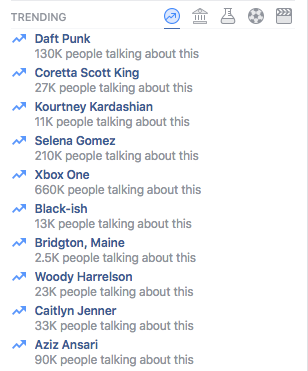 Top: A stream of Facebook posts using that hashtag that have seen the most engagement — which usually means posts from influential people or brands that have a lot of followers — and your Facebook friends posting using the hashtag. 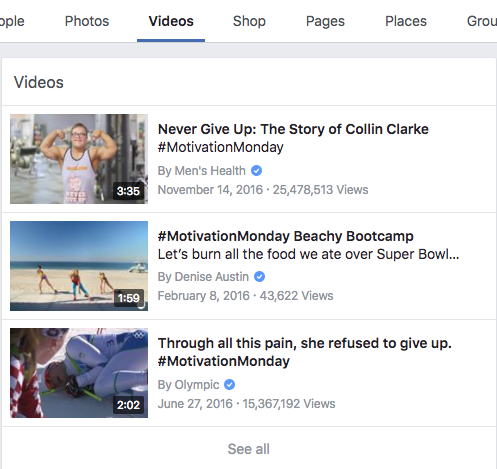 Latest: A stream of public Facebook posts using the hashtag, usually by influencers, brands, or publishers — like a fitness guru posting an instructional workout video. People: People on Facebook with a name officially associated with the hashtag. 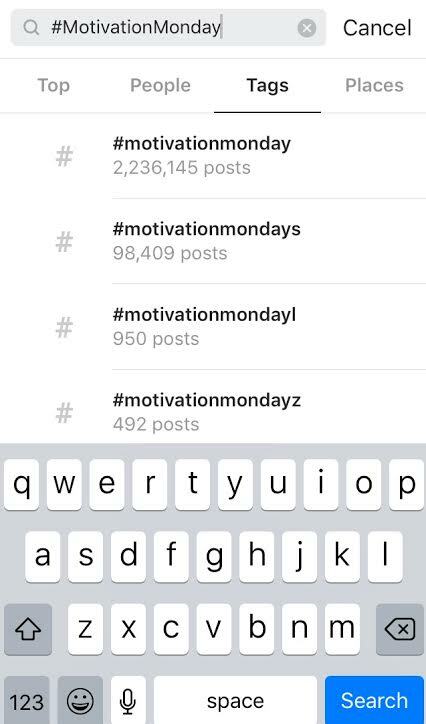 For a hashtag like #MotivationMonday, there are no results here. Photos: A stream of public Facebook posts using the hashtag that have photos in them. Videos: A stream of public Facebook posts using the hashtag that have videos in them. Shop: Pages can now sell their products directly to Facebook users using this feature. For a hashtag like #MotivationMonday, there are no results here. Pages: This tab shows Facebook Pages associated with or posting about the hashtag you’ve searched for. Places: Places in the world with a name officially associated with the hashtag. For a hashtag like #MotivationMonday, there are no results here. Groups: Groups with a name officially associated with the hashtag. Apps: Facebook apps with a name officially associated with the hashtag. Events: Facebook events with a name officially associated with the hashtag. Be sure your post is public if you want people other than your Facebook friends to be able to find it. 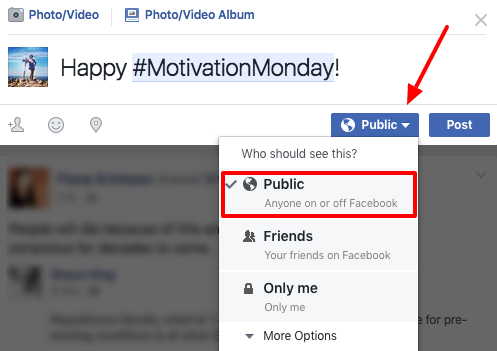 To make a Facebook post public, click on the button to the right of “Post” and choose “Public” from the dropdown menu. If you already know the hashtag you want to search for, there are two main ways to search for it: a simple search or by typing it directly into the URL. You can also search for a hashtag by typing it directly into a URL like so: facebook.com/hashtag/InsertHashtagHere. So #MotivationMonday can be found at www.facebook.com/hashtag/MotivationMonday. If you’re searching for popular hashtags from scratch, the best place to look is the trending topics bar on the left-hand side of your homescreen. (Note: This is currently only available in English in select countries.) The articles and hashtags Facebook shows you are based on a number of different factors, including engagement, timeliness, pages you’ve Liked, and your location. An Instagram hashtag ties the conversations of different users into one stream, just like on Twitter and Facebook. 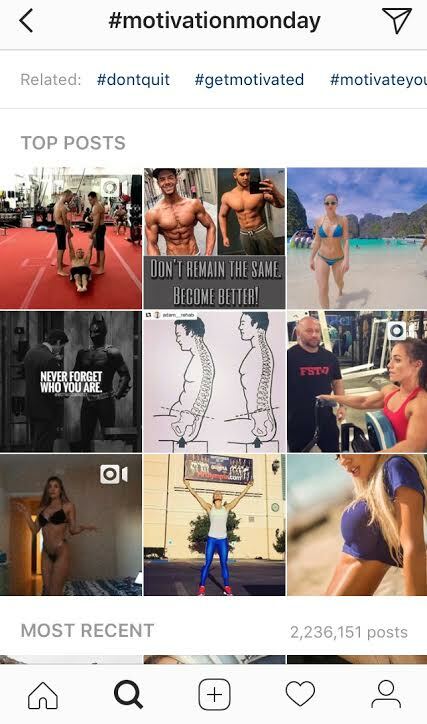 If Instagram users who aren’t otherwise connected to one another talk about the same topic using a specific hashtag, their posts will appear in the same stream. Notice the user interface on Instagram’s hashtag stream is much simpler than those on Twitter and Facebook. There are three things you can do from this page: Scroll through related hashtags, look at the Top Posts, and browse Recent Posts. Related Hashtags: All related hashtags (like #dontquit, #getmotivated, etc. in this case), which users can scroll through sideways. Top Posts: The nine posts using that hashtag that have seen the most engagement — which usually means tweets from influential people or brands that have a lot of followers. This is limited to nine posts. Most Recent: A live stream of Instagram posts from everyone posting that hashtag. As long as your account is public, anyone who does a search for that hashtag may find your Instagram post. 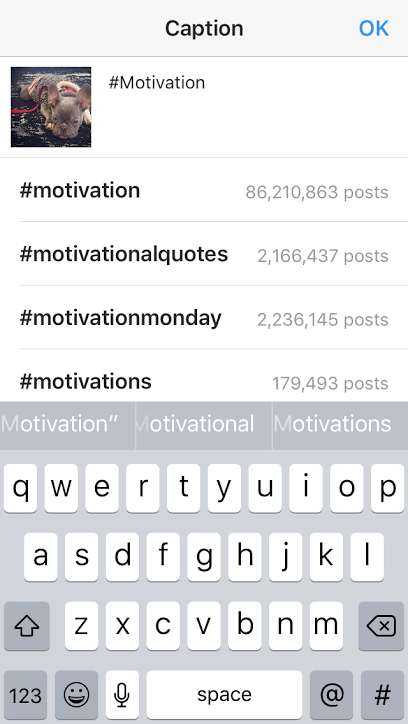 If you’re searching for popular hashtags from scratch, the best place to look is in Instagram’s “Explore” tab. 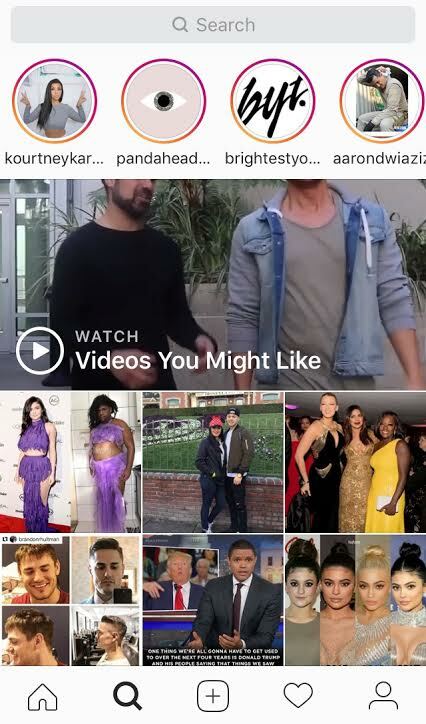 Here, you’ll find popular posts liked by people whose posts you’ve Liked, or posts that are Liked by a large number of people in the Instagram community. Go to the “Explore” tab by clicking that magnifying glass at the bottom of your screen. Check out posts there to browse trending hashtags by scrolling down. What About Using Hashtags “in the Wild”? Although hashtags were born and work best online, you can point people to them in real life. Try placing hashtags in relevant and well trafficked public locations — like in pictures or posters, menus, stickers, and so on — to encourage people to search for that hashtag online. What other hashtag tips do you have for Twitter, Facebook, and Instagram? Share with us in the comments. Editor’s Note: This post was originally published in February 2016 and has been updated for freshness, accuracy, and comprehensiveness.